The Majha (Punjabi: ਮਾਝਾ (Gurmukhi), ماجھا (Shahmukhi); Mājhā) region is recognized as the region that is located at the center of the historical Punjab region, that is northward from the right banks[note 1] of river Beas, and extends up to river Jhelum at its northmost. 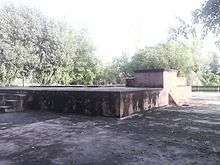 People of the Majha region are given the demonym "Mājhi". 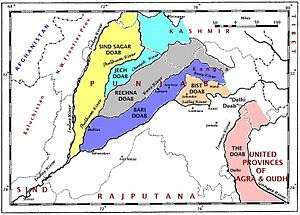 The Majhi dialect of Punjabi language is the main language of this region, which is also the standard dialect of the Punjabi language. During the partition of India in 1947, the Majha region of Panjab got split into India and Pakistan when Panjab India and Punjab Pakistan were formed. 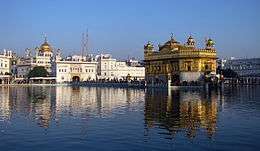 The Majha region of Indian State of Panjab covers the area between Beas and Ravi rivers, including the area on the north of Sutlej, after the confluence of Beas and Sutlej at Harike in Tarn Taran district, extending up to the Ravi river, which is all part of the Majha region in India. 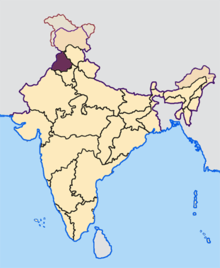 This region contains four districts of Indian state of Panjab - Amritsar, Tarn Taran, Gurdaspur, and Pathankot. 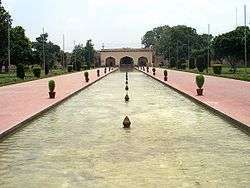 Though partition split the Punjab Province (British India) into two states of West Punjab (Punjab, Pakistan) and East Punjab (Panjab, India), however the historic Majha region is arguably still the same as before since the partition does not change the previous history of Punjab, therefore does not change the geography of the Majha region of the historic Punjab region. The Indian state of Panjab has continued to recognize the Majha region through maintaining the districts that have always belonged to the renowned historic Majha region. 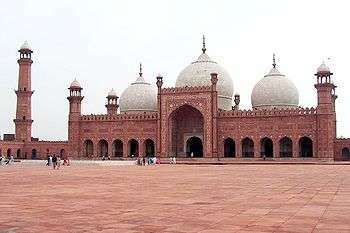 However, Majha being the only region that Punjab, Pakistan had, it has made Lahore as its provincial capital consisting of 10 sub-divisions such as Bahawalpur, Dera Ghazi Khan, Faisalabad, Gujranwala, Lahore, Multan, Rawalpindi, Sahiwal and Sargodha. Hari Singh Nalwa (1791–1837), renowned warrrior and Commander-in-chief of the Sikh Khalsa Army, the army of the Sikh Empire. ↑ The left/right bank of a river is determined by looking in the direction of flow of the river (facing downstream). 1 2 3 Grover, Parminder Singh (2011). 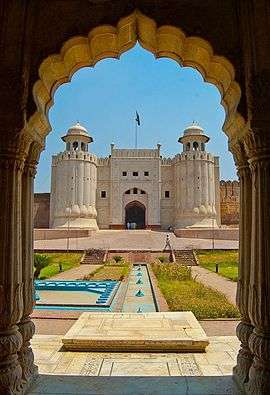 Discover Punjab: Attractions of Punjab. Parminder Singh Grover. p. 179. ↑ Advanced Centre for Technical Development of Punjabi Language, Literature and Culture, Punjabi University, Patiala Punjabi University, Patiala. ↑ Mahmood, Cynthia Keppley (1996). Fighting for Faith and Nation: Dialogues with Sikh Militants (Contemporary Ethnography), p. 153. Philadelphia, University of Pennsylvania. ↑ Kakshi, S.R. ; Pathak, Rashmi; Pathak, S.R.Bakshi R. (2007-01-01). Punjab Through the Ages. Sarup & Sons. ISBN 978-81-7625-738-1. Retrieved 12 June 2010. ↑ Singh, Raj Pal (1998). Banda Bahadur and His Times p. 22. Harman Pub. House, 1 Aug 1998.